I just received wonderful news — CryPeace won the 2018 Wilbur Award for best faith-based blog for the story, Motorcycle Diaries: Friday the 13th Motorcycle Rally! Although I've traveled the world capturing peace stories, this day in rural Ontario was one of the highlights of them all. I am personally encouraged by this recognition, but more importantly, it will help share the stories people entrust to me more widely. 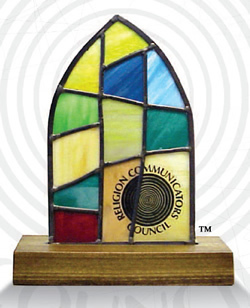 categories, the awards honor excellence in communicating religious issues, values and themes. They are named after Marvin C. Wilbur, a pioneer in the field of religious public relations. The award ceremony culminates RCC's annual conference, which is focused on peace and justice through communication in 2018 — CryPeace's mission. I'll be there to learn, share, and accept the award. CryPeace was born of my personal passion to share stories which inspire and nurture peace around the world. I don't believe anything exceeds the power of personal stories to open one’s eyes and soften one’s heart. My gravitational pull towards peace initially compelled to respond to the Rwandan genocide, but has since taken me to Uganda, Kenya, Israel, Palestine, Cyprus, Turkey, Cambodia, Mexico, El Salvador, the Dominican Republic, Panama, France, the United States, and Canada. God always provides divine connections and stories that break open my heart. Testimonies of people who have overcome hatred, disabilities, or taken bold leaps of faith inspire me to be more courageous in my own life. I sense more tangible ways to build peace may be coming. Follow CryPeace. Stories are a sacred trust. Help me share them more widely by following and promoting CryPeace on your favourite social media. Volunteer. Learn about our current volunteer opportunities. As for me, I'm going to redouble my efforts to share more stories. It's a privilege to "hold the microphone" for people and encourage them to share stories, and they always enrich my life. I'm grateful to know they enrich others' lives, too.